At the USHCC Foundation Chamber Training Institute (CTI), you’ll focus on all three. During our 2-3 days of accelerated, thorough training, you will explore a range of topics and build leadership skills with faculty from the University of Notre Dame – Mendoza College of Business. The CTI program gives chamber and non-profit business association leaders the opportunity to learn from experts, and provides them with the necessary tools to work more effectively to strengthen local business communities. For over 6 years, more than 266 chambers of commerce have attended and more than 1,000 participants have received a certificate of completion from the University of Notre Dame – Mendoza School of Business. Beginning in 2017, chambers are also eligible to earn a “CTI Certified” designation after attending 3 CTI trainings. With CTI you will find opportunity, gain efficiency, and see yourself and your chamber grow. For any questions about the trainings please email Elva Lima at elvalima@ushccf.org. 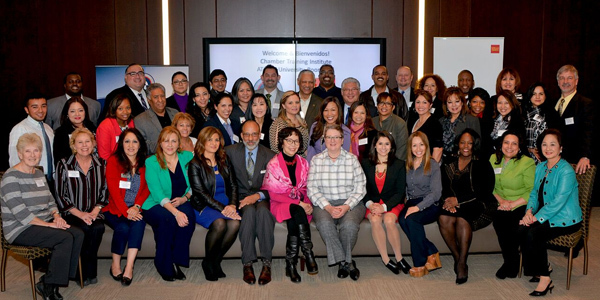 The United States Hispanic Chamber of Commerce Foundation, in collaboration with the National Gay and Lesbian Chamber of Commerce (NGLCC), U.S. Black Chambers Inc. (USBC), and the United States Pan Asian American Chamber of Commerce, works to enrich the experiences of future leaders in the world of business through life-long learning and support. The Chamber Training Institute is one way the chambers come together to make a difference! Registration Now Open for 2017 Trainings! Open to local chamber leaders, including board of directors and volunteers. Click here to view posted resources from past Chamber Training Institutes!